I have to admit, this was a hard weekend. 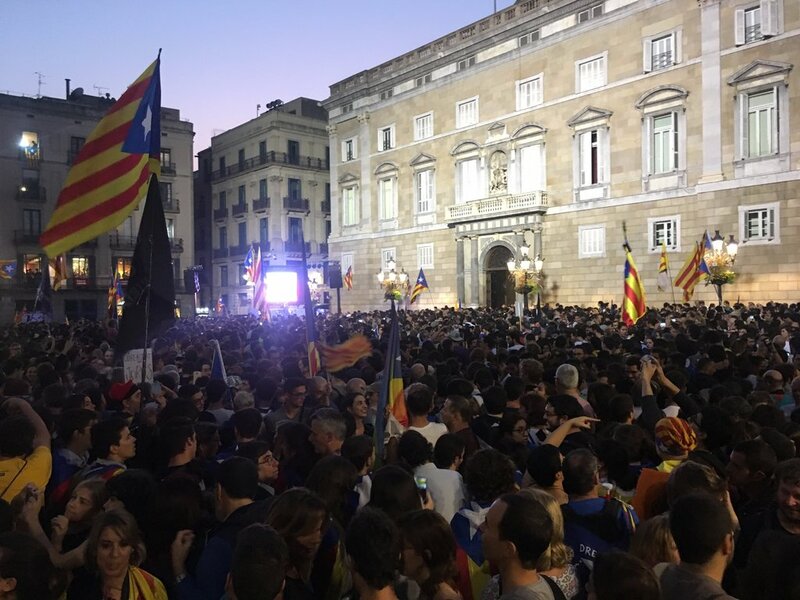 On Friday, our Parliament finally approved a declaration of independence and sure, the Plaça Sant Jaume was packed for the celebration, but it still felt somewhat subdued. The fact that the President didn’t come out on the balcony to greet us was disappointing. But I’ve lived here a long time, and if there’s one thing that I know about Catalans, it’s that they don’t like to gloat, or take too much credit. So I went home, like everyone else, and kind of waited for instructions. The Spanish government had promised to dissolve the Catalan government and remove the president, vice president and all of the cabinet. And after they beat peaceful voters on October 1st and then imprisoned the two leaders of the two staunchly non-violent activist groups (one of which is a cultural society that gives book awards for pete’s sake), we knew that the reaction from the Spanish would be swift, cruel, and disproportionate. All day Saturday was disconcerting. Everybody wondering what was going on. I finally created a Twitter list so I could follow all of the government members at once to make sure I didn’t miss anything. The president made a show of walking through his hometown of Girona at midday, having lunch in a local restaurant (while Spanish TV gawked). At the same time a short, pretelevised speech was broadcast in which he called for ‘democratic resistance’ to the unlawful and unmeasured application of Article 155 of the Spanish Constitution by the Spanish Government. Disconcerting news began to appear. The chief of the Catalan police, Josep Lluis Trapero, had already accepted his dimissal by the Spanish government—theoretically for his actions during the demonstration on September 20th, but also for the squad’s refusal to use violence to move voters from polling stations on October 1st. Trapero became a hero in August thanks to the department’s quick and effective reaction to the terrorist attack as well as his non-apologetic use of Catalan in response to question asked in Catalan to the annoyance of a Dutch journalist. Sunday was almost worse. Almost total radio silence. The usually active ANC and Omnium told us to go shopping, take a walk, lead regular lives. It was not enough information. Democratic resistance. What does that look like? All the ministers promised that they would be at work Monday morning, but how would that work. What would we do without allies in the Mossos? Why hadn’t they asked us to protect the Parliament? Should we protect the Catalan government headquarters, the “Palau” in central Barcelona so that the president could arrive and go to work? We patiently, nervously waited for Monday morning. And Puigdemont was nowhere to be seen. At a little before 8, he posted a picture taken from the Patio of the Orange Trees, inside the Palau, saying Good Morning looking up at a cloudy sky. I was standing outside the Palau looking at a totally blue sky. But there were other signals. The minister of territory and sustainability posted pictures from his office, with today’s newspaper on his desk, insisting that he was following his regular schedule. The president of the Parliament posted a video of her arrival at the Parliament. Members of the Ministry of Economy arrived and went to work. Still no president. Messages from friends who are civil servants. Having meetings, trying to decide what it means to resist. How that will work, what it will look like. Catalonia has 200,000 civil servants. There is no way that Spain is going to change policy in the next seven weeks. And what about these elections? Spain was insisting that it would impose snap elections on Catalonia to elect a new Parliament in order to replace the one it had removed. This was clearly a sign of weakness. A signal that it knows as well as we do that it simply does not have the capacity to impose its will in Catalonia. Look at what happened on October 1st. For months all of the Spanish government from Rajoy through Soraya to every other unionist politician, in Madrid and in Catalonia, swore there would be no referendum. They did everything they could think of to keep it from happening. They confiscated “democracy” posters, they shut down innocuous informational government websites, they arrested government officials, stole literally millions of ballot papers, threatened pollworkers with 300,000€ fines, relentlessly and fruitlessly hunted for ballot boxes, and as the coup de grace, sent riot police to 92 polling places, some in towns with populations as small as 200, to beat up peaceful waiting voters who responded by putting their hands in the air, and chanting “we will vote, we will vote”. Further, Puigdemont’s two attempts to get Madrid to the negotiating table had failed. He single-handedly suspended the declaration of independence at the request of EU officials and perhaps others, but Madrid took the gesture as weakness and turned the screw tighter, promising Article 155, arresting the Jordis, and refusing to talk. And then, when he had all but promised a declaration of independence in every major news outlet, he suddenly seemed to have done an about-face and said he was willing to call snap elections—a suicide mission that would basically torpedo the independence declaration, if Spain would back down from applying 155. And Spain refused. These two gestures were clearly aimed at Europe. They showed that he was willing to negotiate and that his priority was on dialogue and the safety of his people, not reckless brinkmanship. Spain failed the test. By doubling down on dismantling Catalonia’s self-government (or threatening to), and insisting on humiliating Puigdemont (or trying to), Spain left Puigdemont no other option than to go forward with the approval in the Parliament of the declaration of independence. There was nothing to be won from backing down except ignominy. Putting independence into effect would be difficult, but who didn’t know that already? Slovenia and the Baltic States sure knew it. Back to Monday midday. Given broad support on the ground but no weapons or desire to use any, how do you democratically resist the massively powerful, authoritarian Spanish state and all its prosecutors? The answer came about lunch time: Puigdemont was in Brussels with several of his cabinet members. Several supposedly leftist pundits (and many trolls) made wisecracks about him fleeing, but a closer analysis shows that it is a brilliantly strategic move. Indeed it is much more dangerous to defy compliance with the Spanish state taking two judicious steps backward to fortify your position from a safer vantage point than to give in and beg clemency. If you think a man who refused to move from Girona even as he became president would suddenly decide to be a fugitive in Europe, you have grossly underestimated him, and his commitment to Catalonia and to the safety of its people. Because what is the only way to keep the Catalan Republic alive, without engaging in any physical struggles over offices or buildings, or pitting rival police corps against each other, while at the same time beginning the legal and diplomatic battles to ensure the Republic’s legitimacy and international recognition? You leave your home in Catalonia and go to Belgium, which incidentally has offered you political asylum. While Puigdemont keeps the Republic in existence with his very person and that of his ministers—remember their legitimacy is already guaranteed by their democratic election in Catalonia’s highest turnout vote in their history—the rest of the government, both municipal and federal, follows his advice to ‘democratically resist’, by going about their regular business until the elections imposed by Madrid in a scant seven weeks. Those seven weeks should be used to begin the constituent process that is the absolutely necessary framework of the new country. We need everyone involved figuring out just what it will look like and how it will be different from what we have now with Spain. With the new Republic in actual existence, those proposals are guaranteed to be much more than gratuitous exercises and endless meetings: they have a real legal venue where they can be applied. We are lucky to have the input and energy of all of those amazing Committees for the Defense of the Referendum and the Republic. And all of the different commissions and committees that have already put so much work into the constituent process. And this is our chance to involve the Comuns and whoever else wants to truly build a better country. Finally, we have to win the elections on December 21st. It would be clever if the very same members of Parliament that were removed from office by the Spanish government could stand again—to make it clear that we are simply reaffirming the Parliament that we already chose on September 27, 2015. And we must have international observers to make sure that Spain does not cheat—it can neither illegalize parties it doesn’t like, nor inhabilitate political leaders it finds distasteful. We must ensure that Spain is putting its very legitimacy into question by insisting on a fair vote. And when we win on December 21st, when we choose a pro-independence Parliament once again, with whatever individual parties or coalitions that choose to run, associated by a common name if that is helpful, we will have solidified the legitimacy of our cause, and no senator from Madrid will be able to stop the countries of the world from recognizing that we have a democratic mandate for establishing our Republic of Catalonia. Thank you Liz for taking the time out to inform us so succinctly of what is the ‘inside’ perspective. And thanks Mike for providing the platform. This is inspiring. Catalonia is creating its future as we watch. Dealing with the stupid and violent intransigence of Rahoy’s government in a non violent way is a big ask but I’m impressed with what’s going on. It must not be allowed to descend into violence. Way to go, Catalonia! Thanks for this Liz. It’s hardly surprising that Mr Puigedemonts move to Brussels is being portrayed as cowardly in the mainstream media. 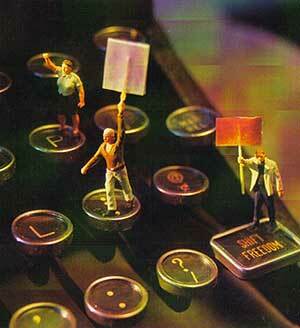 In my opinion it’s easy to be brave behind the keyboard. Not so easy when you are facing prison, or when you are aware that like Puigedemont that what you say could risk the livelihoods of many ordinary people who would face a real risk of violence from the Guardia Civil etc in any public protest. I hope Puigedemont is able to create a government in exile and that peaceful resistance continues until pro Indy parties win the coming election. This is the president which the BBC continually describes, with marked emphasis, as “the DISMISSED President”. Thanks for this report, I wish you all the best. From my perspective though it looks to me like Puigedemont is a man without a plan. Like the Grand Old Duke of York he has marched his troops to the top of the hill only to march them down again. It was widely predicted that the Spanish would disrupt the vote and the vote would thus not be conclusive. So what then? What was the plan after that high energy point? I assume the plan up to then was to create an excitement around independence that would garner more support, and that the repression of Spain that would provoke would in turn build more support for independence once it was revealed to the doubtful what the true colours of Spain really were. But then what? If you are serious about taking power, and not just conducting elaborate publicity stunts, then surely some revolutionary action is required to resist the expected Spanish onslaught? Craig Murray suggested that all civil servants in senior positions and all judges should be asked to sign a statement swearing loyalty to the new republic, and if they refuse, to sack them and replace them with those who will. There must be effective resistance to the Spanish takeover. Puigdemont has let the momentum slip. He has allowed the Spanish the space to move in loyalists to these positions and intensify their grip. I don’t believe an election is going to happen on 21st December. That is a fairy story. Sad you believe it. They will push the date back and back until they have got sufficient grip over Catalonia that they can ensure the election outcome that they want. I would be curious as to how this would work in a newly independent Scotland, considering that Whitehall still appoints and ‘sends up’ virtually all senior civil servants to Scotland as part of ‘Her Majesty’s Home Civil Service’. A written constitution appears to be the main difference between the Spanish and UK political ‘unions’, the Spanish constitution setting out Catalonia’s subjugated position. Rajoy is therefore able to act ‘lawfully’ backed by Spain’s constitution. The constitutional/legal position is quite different here in the UK. Scotland has the distinct advantage in that, constitutionally and legally, the absence of any written UK constitution means that the UK ‘union’ can be undone in the same way it was ‘constituted’, i.e. by a simple majority of Scotland’s elected MP’s. The SNP majority of Scotland’s MP’s could do so now, if they were so minded; legally, there is little Westminster could do to stop Scotland becoming independent. Unlike Catalonia, Scotland is not bound to a political union by any written constitution. There are good reasons why the SNP will not go the UDI route Alf no matter how much you insist they should. If we accept that the people of Scotland must vote, in a referendum, for independence and they then vote NO, the outcome has to be accepted. You can’t just change the method and ignore a vote that’s barely three years old! This principle applies with or without a written constitution. I’m simply stating the correct constitutional and legal position, Jo. A “principle”, like a ‘convention’, is neither constitutional nor legal, as the UK Supreme Court brexit decision illustrated. Many pro-independence supporters like myself have never believed that a referendum is a necessary prerequisite for Scotland’s withdrawal from the UK union. Constitutionally and hence legally the union can be undone in the same way it began, via a simple majority of Scotland’s elected MP’s and that has always been well understood; this is Scotland’s constitutional and legal reality and right. ‘Principles’ are ten a penny in politics, as we see repeatedly, i.e. meaningless. Jo, furthermore the situation surely changed after Westminster refused a second (mandated) indyref, and also ignored Scotland’s EU remain vote. Where are their ‘principles’? They have none. For these reasons alone there is a good case for the SNP majority of MP’s giving notice now to withdraw Scotland from the union, perhaps subject to a further referendum though a ref which is far better managed and regulated than indyref1. Mike it’s payday , my donation will be actioned this week. Readers with 9 days left on fundraiser it’s time to dig deep. An inspirational appraisal of events by Liz Castro who writes and expresses her thoughts on this forum. I recognise that I would be otherwise ignorant of an accurate factual appraisal of events shaping the development of this new State. My thanks to Liz Castro and Bella. Help with financial support and maintain this valuable platform support Bella. Thank you Liz and all good wishes to you.